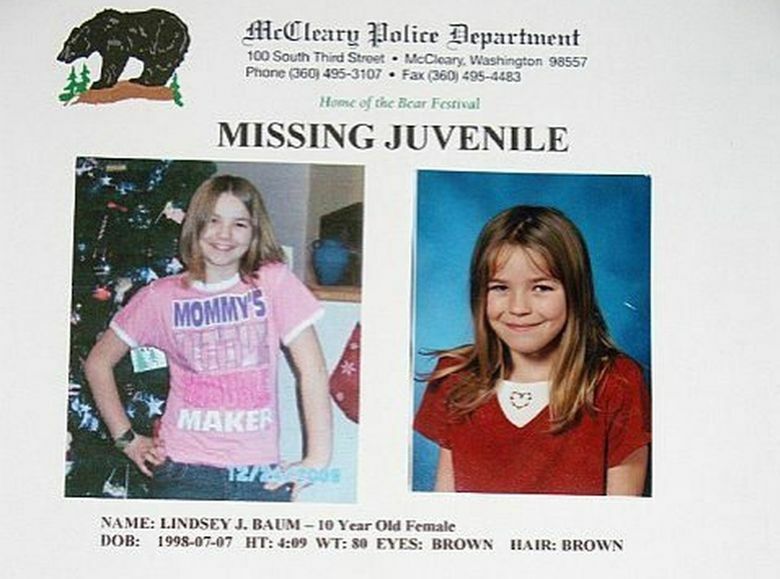 Lindsey Baum, 10, disappeared at about 9:30 p.m. on June 26, 2009, while walking home from a friend’s house. Despite extensive searches in the hours and days after she vanished, no sign of her was ever found. For almost nine years, the parents of Lindsey Baum circulated fliers with their 10-year-old daughter’s smiling face, hoping one day she would return home. That wish disappeared Thursday when the Grays Harbor County Sheriff’s Office announced a DNA analysis confirmed the remains of the girl, who lived in the small community of McCleary, as those found by hunters in a remote area of Eastern Washington last fall. “We’ve brought Lindsey home,” said Grays Harbor County Sheriff Rick Scott, making the announcement. He released only sparse details about the discovery, omitting the exact location or piece of land on which the remains were found. Relatives, friends and neighbors reacted to the news Thursday with devastation and prayers on social media and beyond, many calling it a necessary step for them to move on. Some recalled their memories following the case or connections to the Baum family. Others, too, who followed the case from a distance, offered condolences. Asked how Baum’s parents reacted to the news, Scott said, “They were understandably devastated.” He said they had maintained hope she would someday be found alive. The development marks a major milestone in what has now become a kidnapping and homicide investigation after years of authorities searching for answers on her disappearance, tracking down more than two dozen possible persons of interest, none of whom panned out as connected. Scott said local authorities had turned the remains over to the FBI for DNA analysis months ago, but the analysis wasn’t done until recently because the remains weren’t connected to a known homicide case. Baum disappeared at about 9:30 p.m. on June 26, 2009, while walking home from a friend’s house. Despite extensive searches for the missing girl in the hours and days after she vanished, no sign was ever found. At the time of her disappearance, Baum was 4 feet 9 inches tall and weighed 80 pounds, with brown hair and brown eyes. She was last seen wearing a light-blue, hooded sweatshirt, bluejeans and black slip-on shoes. Missing fliers include photos from that time, as well as one of how she may have looked now. At one point, the sheriff’s office was offering a reward of up to $35,000 for information on her whereabouts and for the arrest and charges against the person or persons responsible for her disappearance. The case gained national attention, including a feature on the cover of People magazine and The Oprah Winfrey Show. One woman, Tamara Sauer, said she grew up in the small town, now with a population of 1,600, and lived there when Baum went missing. Search parties canvassed wooded areas at all hours of the day and hung missing fliers all over. The search also included helicopters, fixed-wing aircraft from the Washington State Patrol and search-and-rescue dogs. Authorities said they spoke to every resident and searched more than 150 homes. “I just need my daughter home,” her mother, Melissa Baum, told an Aberdeen news outlet at the time. McCleary is north of Highway 8, about 30 miles from Aberdeen and near the Capitol State Forest. The fear among the community and Baum’s family at that time, Sauer said, is indescribable for those who did not live through it. A Facebook group dedicated to Baum requested privacy for her relatives, close friends and mother as they grieve. In the yearslong quest to identify possible suspects, a process that included the release of several surveillance videos and news headlines, authorities in Grays Harbor County most recently investigated a possible link between Baum’s disappearance and three elderly Seattle brothers who were each charged last year with two counts of second-degree possession of depictions of minors engaged in sexual conduct. Charging papers filed against the men said a search of their home turned up volumes of sexually explicit images and videos of young girls, along with girls’ clothing, shoes, toys and handwritten notes about girls being kidnapped, raped, tortured and killed. “Someone knows something,” he said. The news wire services and Seattle Times news researcher Miyoko Wolf contributed to this story.